Kinlochewe ~ Dundonnell, NW Highlands. On the weekend of 10th ~ 12th May RM Cadets from all over North West Area attended Rochdale unit for the selection process to become a member of this years expedition team. 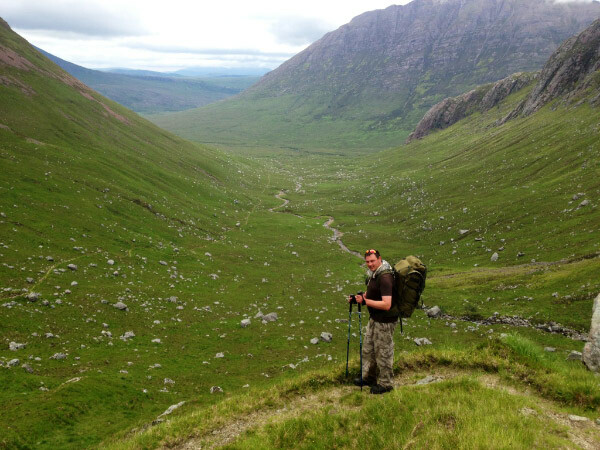 Between 12th ~ 16th July the RM cadets and instructors from Bravo Company walked from Kinlochewe to Dundonnell in the Highlands of Scotland through some of the most wild terrain left in the UK. Before this however there was the small matter of passing selection where 8 cadets would be chosen for the team. Cadets from across the Area arrived at Rochdale SCC unit for 2100 on Friday evening where they were given briefings on what to expect over the weekend and on the expedition itself. The real fun and hard work began on the Saturday morning: after breakfast the cadets were split into 4 teams and completed the first of three leadership tasks, after a de-brief it was bleep test time where every cadet gave 100% effort, the first cadet fell at level 10.7 and the last at 15.8, a hoofing effort considering the Police force standard is 7.5! It was going to prove tough picking just 8 cadets from this lot! After a quick stand easy it was fitness test time followed by pull ups on the bar, again every cadet showed true grit and fitness standards that genuinely took the training team by surprise, this was going to be some weekend. After another stand easy it was outside for a 1-1/2 mile run and a strength test involving two full jerry cans, again the RM cadets were making us proud and speechless! Lunch time and then time for a navigation exercise out on the hills, the cadets were split into their 4 teams and the staff were sent out to the 5 checkpoints, the cadets were given a radio per team and their first 6 figure grid reference and away they went. I’m happy to report that every team checked in at all their RVs just to make our job of choosing 8 easy!? By the time the nav exercise had finished there were some tired cadets on the mini bus, time for the DS to turn the screw a little, as soon as they entered the unit it was leadership task number two on the main deck, this time paper and pencil equaled brain ache, some of the guys were threaders but still smiling! Leadership task 3 followed with ropes and spars after dinner bringing us to 2030 and some tired RM cadets! They relaxed for the rest of the evening after sorting their admin for Sunday morning, the training team spent Saturday evening discussing the candidates and it was agreed that we would all disagree! It was proving hard to separate at least ten of them. Sunday morning and after breakfast we were again heading for the hills for training on rope work and security on steep ground, it was obvious we had some tired cadets present but again I’m glad to report all of them were smiling.The training went well and after lunch it was time to clean ship and the ASOAT and I to pick the team. 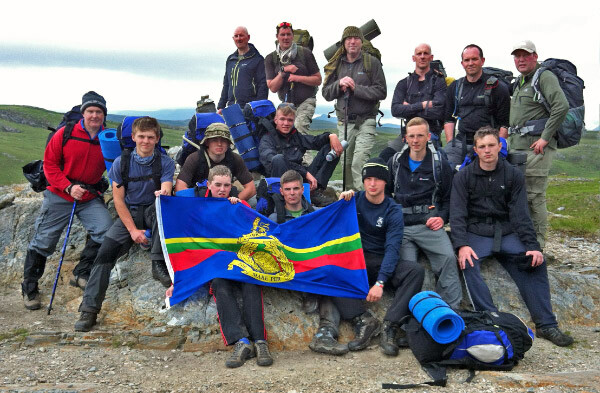 The 8 RM cadets chosen to represent Bravo Company (NW Area) worked extremely hard during the weekend as did all of the cadets, it was a hard decision to choose just 8 of them but we believed the cadets chosen would be able to complete the expedition. The feedback from all of the cadets was fantastic with a lot of comments saying that it had been the best cadet course they’ve attended and they wish there were more courses like this, myself and the team were delighted with these comments and we were all looking forward to the expedition. On Friday 12th July the team headed up to the Highlands in a Mini bus and crew bus, our Area Officer, Commander Mark Irwin came out to meet us and wave us off from Penrith station, it was appreciated by all of the cadets and staff. Of course a stop at Spean bridge was a must to pay our respects at the Commando memorial, a first visit for all of the cadets and also a couple of the staff. We arrived at Badrallach campsite at 1900 and pitched the two huge tents, a quick supper was prepared and personal admin sorted for the mornings trip back around to Kinlochewe and the start of the trek. The team set off from Kinlochewe in fine spirits and big smiles, the weather was perfect with a nice breeze to keep away the dreaded midges! 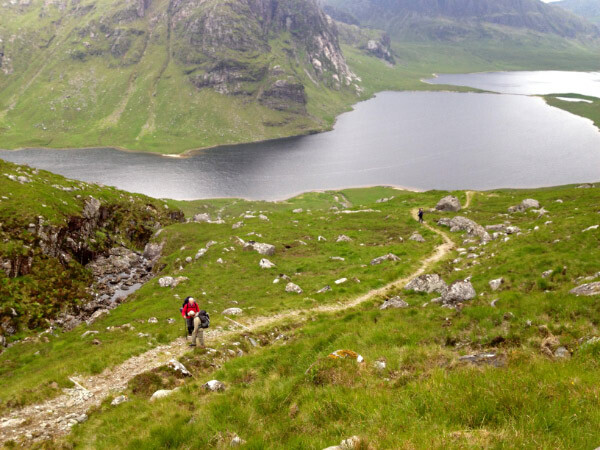 We completed stage one along Loch Maree to the Letterewe estate averaging 3.7 mph, a great pace which took its toll over the Beallach to Carnmore bothy, our first night’s accommodation, the weight of the Bergen’s plus tired legs were beginning to show. However the team arrived at the bothy in high spirits and cracked on with sorting our accommodation out for the night, not an easy feat at Carnmore as its not the best bothy in the Highlands! An evening meal was prepared, Thai Green curry & rice…..hoofing!? Sunday morning arrived bright and early so we set off for Shenavall bothy with a steep immediate climb to wake us all up and sort the creaking shoulders and backs out! As we crested the ridge we could see Shenavall in the distance and we smashed the stage up to the river at another good pace to match the day before, we crossed the River and arrived at our second nights accommodation at 1300! 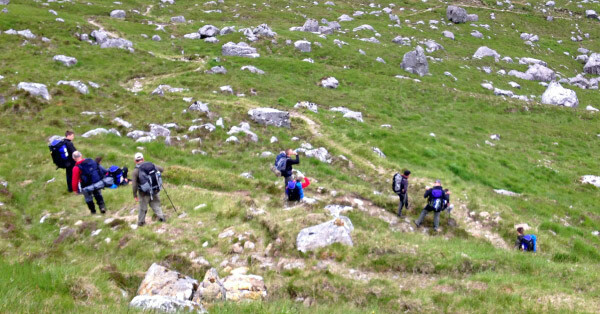 We put an idea to the cadets that if we completed the walk now we could have a jolly on the Isle of Skye tomorrow, it was only around 12k (with a big ascent!) The cadets decided on a Chinese parliament during lunch, we awaited their decision, they decided to go for the finish in two days rather than the three! (I was gutted! 🙂 to say I was looking forward to a rest is an understatement!) So we once again set off straight into a punishing ascent to test the legs, I’m happy to report the team made it out onto the road at Dundonnell after crossing one of the last remaining wildernesses in the British Isles. I was and still am extremely proud of these young guys, they all showed courage, determination, cheerfulness and teamwork, it was a fantastic trip and we are already planning next years adventure.